LIC Navjeevan Table No 853 is a new insurance plan by LIC in 2019. LIC NavJeevan Plan is the second insurance plan launched by LIC in the year 2019. Prior to this LIC has already launched LIC Micro Bachat Insurance Plan 851. LIC Nav Jeevan is non-linked, with profit, Endowment Life Insurance plan. Navjeevan means New Life. 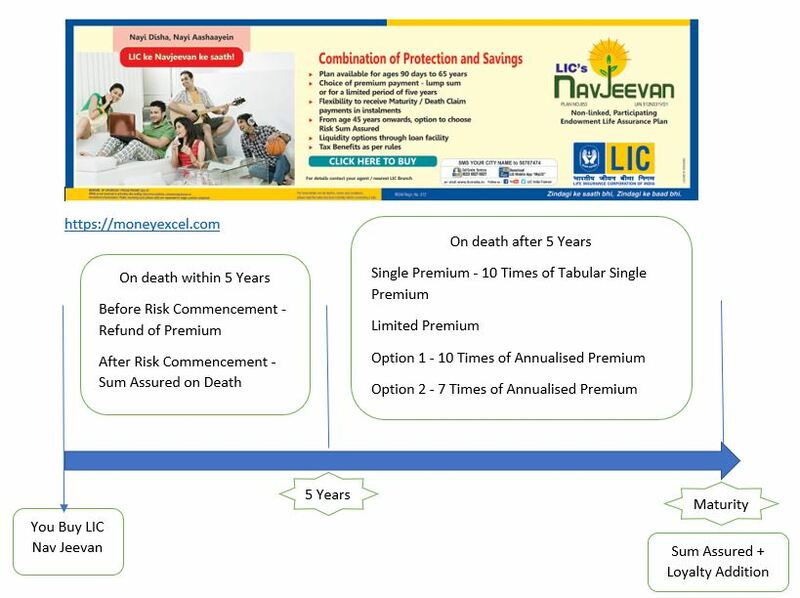 LIC Navjeevan Plan 853 provides two different premium options. One can opt for a single premium or limited premium payment term of 5 years. Under Single premium payment, the ‘Absolute Amount Assured to be paid on Death’ shall be 10 times of ‘Tabular Single Premium for the chosen Basic Sum Assured’. Under the Limited premium payment, if the life proposed is aged 45 years and above, shall have two options to choose the ‘Absolute Amount Assured to be paid on Death’ which is as under. If the life proposed is aged below 45 years, only Option 1 is available. Under Limited Premium Payment option, the proposer has to choose one of the options at the proposal stage itself. The option once chosen cannot be altered at a later stage. LIC Navjeevan is Endowment Plan that pays a lump sum amount to the policyholder after its maturity or to the nominee in case of policyholder’s death in policy term. This plan is available offline as well as online. LIC Navjeevan is Endowment life insurance policy. Under this plan single premium as well as limited premium payment option available. Minimum sum assured is 1 Lakh. No limit on the maximum sum assured. This plan is offered with optional accidental rider and disability benefit rider. Option to avail death benefit in Installments. This policy shall participate in the profits of the corporation in the form of loyalty additions. Who is eligible to take LIC Navjeevan Insurance Plan No. 853? The eligibility criterion, sum assured detail and term of this insurance plan is given in the following table. On the life assured surviving to the end of the policy term, provided all due premiums have been paid, “Sum Assured on Maturity” along with Loyalty Addition, if any, shall be payable. Where “Sum Assured on Maturity” is equal to Basic Sum Assured. Before the date of commencement of risk: Refund of premium without any interest. Examples of Sum Assured on Death under different options opted by the Policy Holders are given below. Under Single Premium as discussed above death benefit is 10 Times of Tabular Single Premium for the chosen basic sum assured. On evaluating LIC NavJeevan Insurance Plan 853 based on various factors I can make out following points. LIC Navjeevan Plan is copy of LIC Micro Bachat Plan. Except few changes such as increase in sum assured, minimum age entry and option of single premium payment. Under this plan, loyalty addition is not payable in the first five policy years. So, if policy holder dies within 5 years from the commencement only basic sum assured is payable. One should not club insurance and investment together. Still if you purchase this policy and survive till maturity you are likely to get return in the range of 4 to 5%. Optional rider is a positive part of this policy. However, additional rider always comes with an additional premium. Premium amount of this policy is very high. LIC Navjeevan Insurance Plan is like old wine in a new bottle. Nothing new about LIC Nav (New) Jeevan (Life) except Name 🙂 It is launched by LIC in the month of March to attract last-minute taxpayers. If you are planning to purchase this plan for tax saving perspective, I would recommend investing in ELSS. If you are planning to purchase NavJeevan for investment, let me remind you it is endowment plan and you are likely to get returns in the range of 4 to 5%. For Insurance coverage, you should buy a Term plan instead of LIC Navjeevan. If you are planning to buy Navjeevan, you should buy using online mode. Online purchase will be less costly as you will get discount on the premium paid. Kindly visit LIC website to know more detail about LIC Navjeevan. Your blog abt LIC Navy jeevan plan is very useful.suppose I would like to invest one lac rupees for coming 5 years.then what would be better alternative in terms of yield. After reading this article also you would like to invest in this plan. Its a big mistake do not do this.